Back in October, HEXUS reported upon the unveiling of the Asus ROG Strix XG49VQ 49-inch gaming monitor. The monitor was a crowd-pleaser at the Incredible Intelligence 2018 Asia-Pacific event in Malaysia during that month. 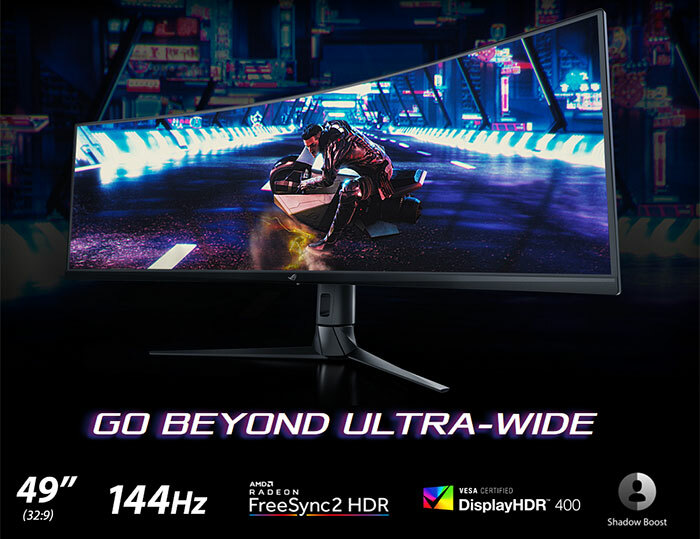 Asus presented this sizable curved monitor on stage at the event urging the audience to "go beyond ultra-wide" and buy this 144Hz FreeSync 2 HDR display with DCI-P3 90 per cent gamut when it becomes available. This morning, Asus UK has written to HEXUS to say that the RoG Strix XG49VQ will be available this month. If you want to check out the full product pages for the Asus RoG Strix XG49VQ, they are available here, as are specs, galleries, and support pages. In brief, this 49-inch 1800R curved monitor is equivalent to two 27-inch monitors working side-by side - but without the middle bezels and gap of course (screen offers 3840 x 1080 pixels). Sometimes you might want to split the picture though - and for this Asus provides PbP modes for two to three sources, as per the picture below. Whatever you do on the display you will benefit from the DCI-P3 90 per cent professional colour gamut coverage and DisplayHDR 400 certification, low latency visuals, and 144Hz refresh rate. 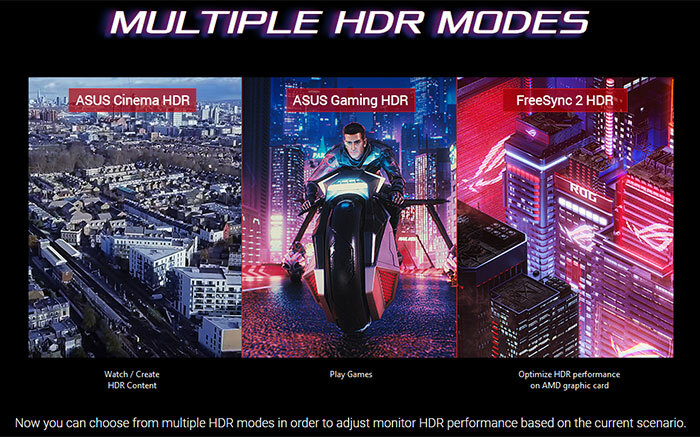 Gamers will particularly appreciate the FreeSync 2 HDR tech which offers VRR support and HDR visuals. Furthermore, for its gamer target market there is; Asus Shadow Boost, Asus, GamePlus Hotkeys, Asus GameVisual modes, Asus GameFast input tech, as well as Low Blue Light and Flicker-free tech. Controlling these features is easy via Asus DisplayWidget or the 5-way OSD Navigation Joystick. 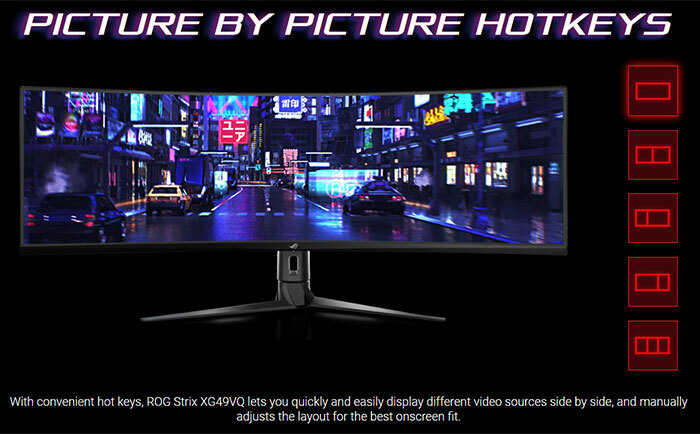 Asus equips the RoG Strix XG49VQ with lots of connection options including DisplayPort 1.2, two HDMI and two USB 3.0 ports. 5W x 2 Stereo RMS speakers are built-in, as is a headphone jack. The supplied ergonomic stand offers tilt (+20°~-5°), swivel (-16°~+16°), and height (0~120mm) adjustments, or can be removed for a VESA 100x100 mounting option. Asus has designed cable management into the monitor stand. Asus says that this 49-inch monitor consumers less than 47W in operation and less than 0.5W in standby. We are told that the Asus RoG Strix XG49VQ will be available sometime this month in the UK and will be sold at or near the MSRP of £999. 3840x1080…. I would rather sacrifice a few HZ and have 1440p. Still, its unreasonably big, I have an ultra-wide now at 3440x1440 120hz and I find that it's pushing the limits of my viewing angles already, I would have to constantly turn my head to view everything on this monster. To wide, resolution too low, too expensive and it only supports HDR400 psuedo-HDR, which is largely pointless. I'll give this one a miss. I thoght the DPI was bad, until I realised it's basically 2x 24" 16:9 monitors in a single bezel. So we have a reference point for the size of the pixels. It's not great, and way overpriced but I would think it would be useful in some situations. I think it says 2x27“ side by side which at 1080P is far too big in my book. I would say at 27” you want to be at 1440 or 1200 depending on your aspect ratio. As for head turning, well, I think that's the point. You'd be happy to do that with two monitors so if you're using this I suspect you'll adapt to using it that way. For gaming, I'm unconvinced. Seems to me if this much immersion is required you might be better off looking at VR. HDR400, they get to tick off a box that says this monitor supports HDR. I think HDR600 should be the minimum for being able to say you have HDR. I'm in the market for a monitor but not this one. I'll wait a few months to see if I can find a 1440p 144hz HDR600 freesync 2 or g-sync ultimate monitor. The g-sync tax has been coming down the last few months.